Please use the official IFAC instructions for authors and template to prepare your contribution as full-length draft paper and submit it on line by December 12, 2011. All papers must be submitted electronically using Symposium Manuscript Management System (CMMS). All papers must be prepared in a two-column format in accordance with the IFAC manuscript style. For final submission, Regular or Special Sessions papers should be 6 pages long. Please use the official IFAC instructions and template to prepare your contribution as full-length draft paper and submit it on line by December 12, 2011. Submission details are available on the symposium website. All submissions must be written in English, and only PDF files are accepted. The copyrights (in electronic form) of all papers are transferred to IFAC when the submission of the camera ready form of accepted papers is completed. All papers that conform to submission guidelines will be peer-reviewed by IPC members. *) At least one author for each paper should register to include an accepted paper in the final program and to publish it in the Preprint and Proceedings volumes. **Final papers will be included in the INCOM'12 Preprints and Proceedings Volume only if Registration Fees are paid until March 26, 2012. 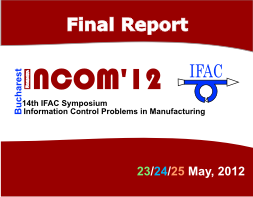 Final papers will be included in the INCOM'12 Proceedings Volume only if Registration Fees are paid and papers are presented. The fees include the Preprints volume in electronic form (CD-ROM) and full participation package: symposium program attendance, coffee breaks, lunches, welcome cocktail and gala dinner. Two events, dedicated to promote science and industrial exchanges! INCOM'12 wants to innovate, by making a real bridge between science, research and industry. Our goal is to provide industry and academics leaders with an exciting opportunity to compare their concepts, visions and needs as well as to initiate possible fruitful collaboration and joint innovation projects. In this spirit, we have the privilege to have associated with us two Industry and Service Innovation meetings: IICS'2012 and SL'2012. The meetings attract a large number of outstanding scientists, technicians and managers worldwide. They offer a platform to discuss and promote latest project results and provide a forum for interdisciplinary knowledge and best practice transfer. Many well-known industrial leaders, solutions providers and integrators, and experts in service science and services ecosystem are expected on site, with main aims at presenting and discussing: (i) the development of integrated engineering and product life-cycle management, (ii) IT systems and their impact on firm's performances or process management and (iii) service science concepts, methods and research issues for manufacturing and service industries. The Industry Meeting "Integrated Information and Control Systems for Smarter Enterprise"(IICS 2012) takes place on May 24 and 25, 2012. This Workshop is organized by the Centre of Research in Computer Integrated Manufacturing and Robotics (CIMR) and the University Politehnica of Bucharest (UPB) in the framework of the INCOM'12 Symposium, with support from the General Association of Engineers in Romania (AGIR), the Robotics Society of Romania (SRR), the Romanian Society of Automation and Technical Informatics (SRAIT) and the General Confederation of the Romanian Industrial Employers (UGIR-1903). The Service Innovation Meeting "Service Links with R&D and Science Base" (SL 2012) takes place on May 21-25, 2012. This Seminar is organized by the University Politehnica of Bucharest, the University Transilvania of Brasov, the Academy of Economic Sciences and the University of Medicine Carol Davila from Bucharest in the framework of the National Grant POSDRU 57748/2010 "Strategic Program Fostering Service Innovation through Open, Continuous Education" (INSEED) funded by the Ministry of Education and Research. During the three days of the IICS 2012 and SL 2012 Meetings, an exhibition space will allow visitors to carry out a real technological survey on the latest developments, products and technologies proposed regarding ICT and automation technologies, services and educational means in Integrated Engineering and Service Oriented Architectures. Engineering and design departments, software developers and technologies suppliers and integrators will present their offer. The conference will take place in the Hilton Symposium Centre of Bucharest, the capital of Romania – a modern European town and also a city with old traditions, having ancient buildings with beautiful architectural monuments. Because of 100-year old "Arc de Triomphe", its large boulevards and beautiful gardens, parks and museums on the border of the northern lakes chain, Bucharest is also called "the small Paris". Information on the social program for accompanying spouses/partners as well as the pre- and post-conference visits and tours will be available on the Internet by the end of November 2010. In addition to papers included in thematic sessions on the conference suggested topics (presented in detail above), a number of special sessions grouped in special tracks will include papers focusing of targeted subjects on most recent trends in manufacturing engineering. 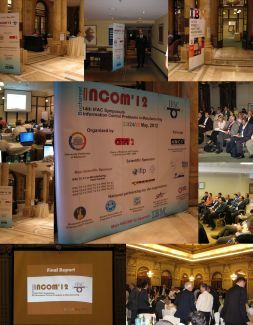 In this call we propose that you consider INCOM’12 as a tool to enhance your own international network by proposing the organization of such special sessions or tracks during this event. Deadline for such proposals for organizing special sessions and/or special tracks is December 12, 2011. Those who are interested in organizing a special session should submit a proposal to incom12@cimr.pub.ro and theodor.borangiu@cimr.pub.ro. • a list of recommended reviewers that should be contacted for the blind reviews (optional). To be accepted, a session must be relevant with INCOM'12 general topics, and the organizers must be from at least two different countries. Once your session is accepted, it will be inserted in the INCOM'12 website. You may then activate your own network to invite researchers to submit their work to your session. This will be done during the standard submission process. The scientific chairs of INCOM will choose the reviewers, considering the ones you eventually proposed, and the papers will be evaluated as regular papers. A paper submitted in a special session is not an invited paper. If enough papers are accepted (at least 4, max.6) the session will be effectively organized and you will chair it. If more than 6 papers are submitted and accepted, the session may be duplicated with the same title into two or more sessions.